What to get the sustainable beauty lovers in your life? We’ve got you covered with our top festive picks. Three skincare treasures, packed full with our unique marine extracts, including the Everlasting Radiance Moisturiser, High Definition Facial Oil and 5 Minute Miracle Mask that protect and renew your skin. It’s perfect for Blue Planet lovers who like to give back, as we've teamed up with The Seahorse Trust to help #SaveStan and millions of endangered Seahorses like him. When you buy this gift, we donate money on your behalf to help save these wonderful creatures and have included a free 4 month Seahorse Adoption pack, so you can get involved too! Everyone has a friend who loves lighting candles and their home always smells like a luxury hotel. If they always get a new candle for Christmas, and you want to surprise them with something a little different, this overnight mask is the perfect alternative (or addition, if you want to spoil them). Enriched with relaxing essential oils (like those that you’d find in natural scented candles) this balm mask intensely nourishes skin during sleep. In the morning, they’ll wake up to radiant, glowing skin. You pick a name from the hat and all of a sudden, panic! What do you get the sustainable beauty lover in your office? Instead of trying to spot their favourite moisturiser in the background of their Instagram stories, we’ve got a much easier option that they’ll absolutely love! Our 4 pack Sustainable Beauty Celebrations include a handful of our top picks - from our Abyssinian Oil Facial Moisture Cream to our Seahorse Plankton 5 Minute Miracle Mask. All 100% natural and vegan too! We all know someone who’s incredibly talented at making things - whether they’re creating their own Christmas cards, upcycling old furniture or whipping up a storm in the kitchen, this is the perfect gift for them. Our Raw Inventions tin is packed full of recipes, ingredients, packages and labels so they can create their own sustainable beauty raw inventions using some of the ingredients they have in their kitchen! Sometimes there’s nothing better than a night dedicated to some ‘me time’ including candles, great music and luxurious beauty products for a much-deserved pamper. Our Abyssinian Oil Skincare Pick Me Ups range - powered with nourishing plant-seed oils - includes the Natural Cream Cleanser, Aroma Facial Concentrate, Facial Moisture Cream and 5 Minute Miracle Mask for an intense moisture boost that leaves skin feeling completely rejuvenated. Our guilty pleasure? Catching up on our favourite shows in the bath. 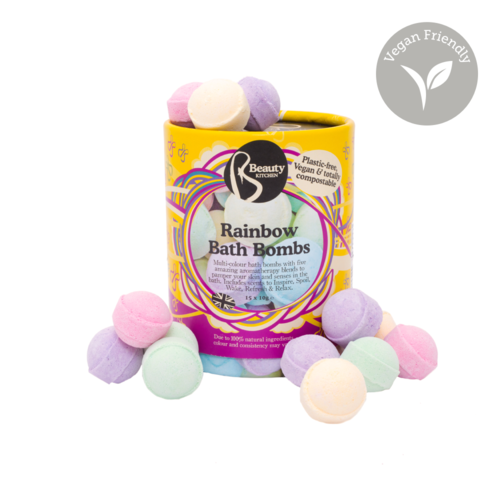 For the person who always knows the latest movies and shows to watch, make their catch-up all that more luxurious with our multi-coloured Rainbow Bath Bombs. Bursting with five amazing aromatherapy blends, they can be switched up as often as their recently viewed shows. What to get the beauty lover who has everything? Something they haven’t tried yet! Our 20 pack Sustainable Beauty Celebrations is full to the brim with cleansers, balms, moisturisers - you name it! We’ve hand selected our absolute favourites so beauty lovers can try something completely different and pick their new go-to products. Want to find more gifts for Sustainable Beauty lovers? Head to our Christmas page!